In November 2005, the Venezuelan Navy signed a contract for four POVZEE vessels. The ships were built at Navantia's Puerto Real shipyard in the province of Cadiz, Spain. The vessels are specially designed to perform surveillance operations in the exclusive economic zone (EEZ) of Venezuela. POVZEE vessels are equipped with an Oto Melara 76mm gun. The POVZEE (Patrullero Oceánico de Vigilancia de la Zona Económica Exclusiva) vessels were built by Spanish shipbuilder Navantia for the Venezuelan Navy. The vessels are specially designed to perform surveillance operations in the exclusive economic zone (EEZ) of Venezuela. The major roles of the vessel are to control and monitor the exclusive economic zone, protect the maritime traffic and support the other units. "In November 2005, the Venezuelan Navy signed a contract for four POVZEE vessels and four smaller coastguard ships." In November 2005, the Venezuelan Navy signed a contract for four POVZEE vessels and four smaller coastguard ships. Two vessels were delivered by August 2011. The ships were built at Navantia’s Puerto Real shipyard in the province of Cadiz, Spain. The steel of the first vessel, Guaiqueri (PC-21) was cut in November 2007 and the keel was laid in September 2008. The Guaiqueri was launched in June 2009 and completed sea trials in June 2010. It was commissioned in April 2011. Construction of the second vessel, Warao (PC-22), began in September 2008 and the keel was laid in May 2009. The vessel was launched in October 2009. It was delivered to the Venezuelan Navy in August 2011. The keel for the third vessel, Yekuana (PC-23), was laid in September 2009. The ship was launched in March 2010 and delivered in December 2011. 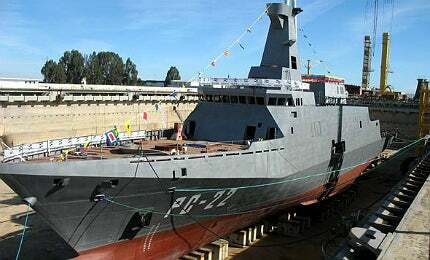 The keel of the final ship in class Kariña (PC-24) was laid down in February 2010. The ship was commissioned into the Venezuelan Navy in May 2012. The POVZEE hull and superstructure are built of steel. The vessel design incorporates a bulbous bow and a wedge in the stern. The bulb improves the hydrodynamic profile of the ship. "The vessels are specially designed to perform surveillance operations in the exclusive economic zone of Venezuela." The technology implemented in the vessel’s design reduces the noise and vibrations of the propulsion system. It also features modern stealth technology that reduces infrared and radar signatures. The flight deck and hangar are suitable for day and night operations and can accommodate a single rotary-wing aircraft. Two rigid hull inflatable boats (RHIB) are also available for transport and rescue operations. The 2,200t ship has an overall length of 98.9m, a maximum beam of 13.60m and design draught of 3.80m. The depth to main deck is 7.20m. It can accommodate up to 92 people. The POVZEE vessels can be deployed in search and rescue operations, marine pollution control operations, drug trafficking, illegal immigration and anti-smuggling missions. The other missions include the surveillance and collection of operational and environmental information and surface defence. The vessels can be operated in Open Ocean and littoral environments. Tests have proven the sea-keeping capabilities of the boat in high sea states which exceed the performance requirements. The ship can sail at a top speed of 25kt, a cruise speed of 22kt and an economical speed of 18kt for 3,500nm. POVZEE vessels are equipped with an Oto Melara 76mm gun. The gun is suitable for corvettes and patrol boats. The gun has a traverse range of 360° and an elevation of -15°/+85°. It can fire 120 rounds a minute with a maximum fire range of 30,000m. It also has 85 rounds readily available in the gun mount. The other weapons include two 12.7mm and two 35mm machine guns. The vessel has provisions for future installation of anti-ship and anti-aircraft missile systems. The patrol vessels are equipped with a SMART-S mk2 multifunction radar developed by Thales. The system operates in S band and provides medium to long-range air and surface surveillance and target designation in complex littoral environments with a maximum instrumented range of 250km. The TACTICOS combat management system integrated with the sensors provides updated data to the commanders. The POVZEE boats are fitted with combined diesel and diesel (CODAD) propulsion system. The system consists of four MTU 12V-1163-TB93 diesel engines rated at 4,440kW each. The four diesel generators of 570kW each supply electric power to the vessel. A total output of 17,760kW is provided by two 5C11 controllable-pitch propellers, developed at Wärtsilä Propulsion in the Netherlands. Guaicamacuto Class offshore patrol vessels or BVL (Buque de Vigilancia de Litoral) are in service with the Venezuelan Navy, deployed across the Exclusive Economic Zone (EEZ) of Venezuela. The Buques de Acción Marítima (BAM) is being built by Navantia for the Spanish Navy. The vessel is intended to replace the aging Barceló, Anaga, Conejera, Toralla and Descubierta Class of patrol boats.